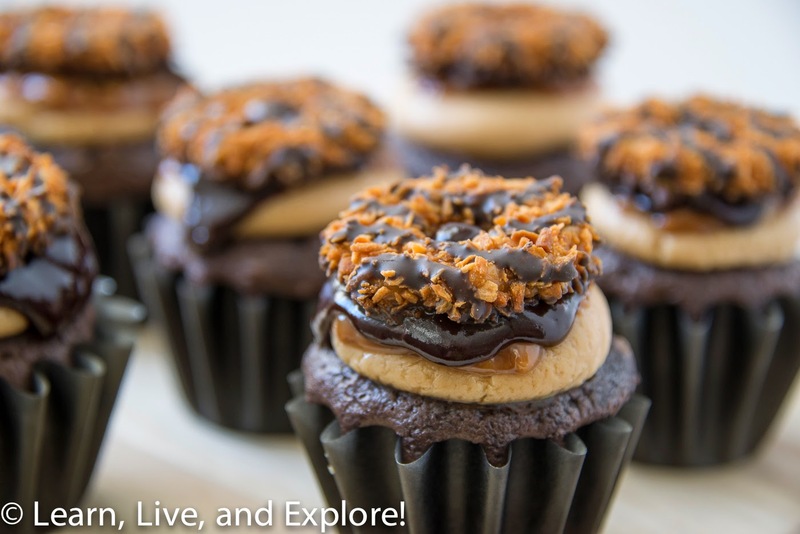 Samoa Cupcakes ~ Learn, Live, and Explore! It's the tail end of Girl Scout Cookie season, so I had to get a cookie-themed cupcake on this month's baking agenda. Last year, I tackled my favorite cookie - the Tagalong, or when I was selling them, the Peanut Butter Patty. This year, I decided to make a cupcake after one of the most popular cookies: the Samoa. I'm ok with a samoa, but it's not my preference. I just don't know how much or if I like the combination of chocolate and coconut. The recipe inspiration was from Cooking Classy, modified for my laziness. For the caramel sauce, in a heavy-bottomed saucepan, heat the sugar and water over med-high heat, whisking constantly to dissolve sugar. When the sugar liquid reaches a boil, stop whisking and allow it to boil until it reaches a dark amber color, swirling the pan occasionally. Once the mixture is dark amber, immediately add the butter and whisk until the butter is melted, then remove from the heat. Wait a few seconds, then carefully pour the heavy cream into the saucepan and whisk to combine. Whisk until the mixture is smooth, then allow to cool for a few minutes before transferring to a glass container to cool completely. While the caramel is cooling, make the cupcakes per the directions on the box and allow to cool on a wire rack. For the buttercream, with a stand electric mixer, whip the butter on medium-high speed until pale and fluffy. Add powdered sugar and blend on low speed until the mixture comes together. Add 1/4 cup + 2 Tbsp of the cooled caramel sauce you made and the vanilla. Whip on medium-high speed until pale and fluffy. Buttercream can be thinned with more caramel sauce. Pipe on the buttercream to the top of the cooled cupcakes using a large circle tip and pastry bag. Toast coconut in the oven at 350 degrees until just golden brown. Crush the toasted coconut in the remaining caramel and stir. In a glass microwave-safe bowl, melt chocolate chips and heavy cream using 50% power in short (less than 20 seconds) heating bursts, stirring after each time until the chocolate mixture is smooth. Using a spoon, create a layer of the caramel toasted coconut sauce. Immediately follow up that layer with one of the chocolate ganache. 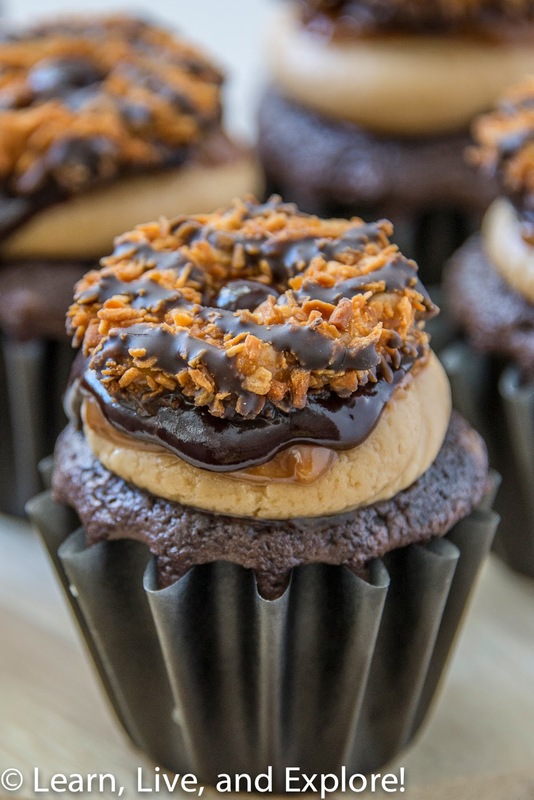 Top the cupcake with a Girl Scouts Samoa cookie. Assembling these cupcakes did not go as smoothly as I had hoped. 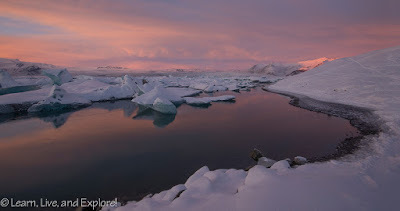 Writing this post, I'm thinking back and wondering if I could have made my life easier by just purchasing a jar of caramel sauce and a jar of chocolate sauce from the ice cream section of the grocery store. Something to test out for next time. Let me know if you try this shortcut, and how it turned out for you!